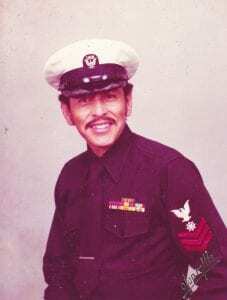 George G. Cordova, USN-Retired entered into eternal rest at his home in San Diego, California on February 10, 2018. He was 76 years of age. He was preceded in death by his parents Celestino and Irene Cordova. George served his country at the height of the Vietnam War. Survivors include his wife Carmen, daughter Sandra, sons George Jr., Miguel and Xavier and grandson Tino, all of San Diego, California. Also surviving are four sisters, Lilia Rodriguez (Inez), Victoria Gomez (Edward), Mary A. Hildebrand, and Mary Jane Alcorta (Richard), numerous nieces and nephews and many close friends. Services were held on February 23, 2018 in San Diego, California.